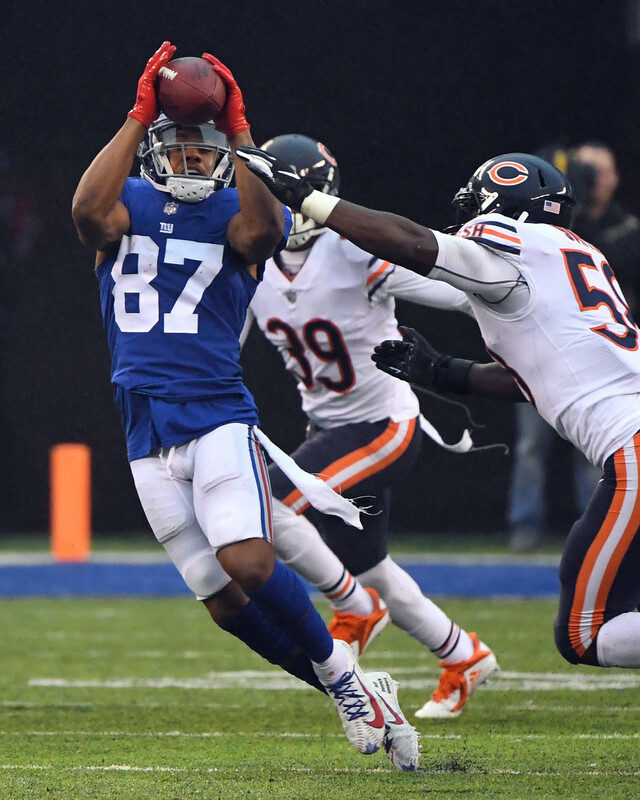 The Patriots had interest in trading for Giants wide receiver Sterling Shepard this offseason, according to Pat Leonard of the Daily News. Of course, that’s no longer an option for the Pats after Shepard inked a four-year, $41MM extension with the G-Men. The value of Shepard’s extension raised eyebrows in the football world, but it’s clear that the slot receiver is well-valued around the league. Had the Giants not re-upped Shepard after his career year in 2018, they would have risked losing him to a free agent market next year that is increasingly strong for receivers like him. Meanwhile, the Pats will have to look elsewhere for offensive firepower. The retirement of Rob Gronkowski, defection of Cordarrelle Patterson, and suspension of Josh Gordon leaves them with little in the way of targets for Tom Brady. The club could still circle back to free agent Chris Hogan, though we haven’t heard much on that front lately. The Pats went after Adam Humphries and Odell Beckham Jr. earlier this offseason, but did not come away with either player. They also pursued Jared Cook – even after he agreed to sign with the Saints – as a Gronk replacement, but they were rebuffed. At this stage, the Pats will probably have to zero in receivers in the draft and summer cap casualties. Technically, the Giants already showed that signing someone to an extension doesn’t take them off the market. Maybe the Patriots can trade for him next year. There’s a 100% chance we hear “we didn’t sign Shepard to trade him” within the next year. Since it’s Gettleman he’ll probably trade him for a long snapper and a conditional 7th. Your logic: ((1st rd + 3rd rd + Good player to fill a need) – (cancer [complaining about happiness after huge contract, disrespecting franchise QB who lobbied to bring you here], brittle [50% games in 2 years], potential to devalue himself [re: AB blueprint])) = (7th rd + longsnapper). That funny moment when the entire league knew the giant wanted to get rid of the locker room cancer that is Odell Beckham Jr. but their general manager still got a first, third and peppers but yet the giant fans are still complaining. Rarely ever do teams get “fair/equal” value in trades, especially for superstar players. I mean the Steelers got a 3rd and 5th round pick for AB. I’m sure the Steelers would’ve loved to get a 1st, 3rd, and a young player on their rookie contract for AB. They got a 1st,a 3rd,and a safety who was a 1st 2 years ago.Basically 2 1st and a 3rd.For a receiver that has missed half the games the last 2 years,and character issues.You should really look up trades involving receivers,ill bet you’ll have a hard time finding many returns comparable to what the Giants got. The Giants, on the other hand, must have been very motivated to trade Beckham, because in addition to paying him the $21.459 million last year, he’s on their books this year for $16 million in dead money. “They could’ve done nothing and paid him $8.5 million in his option year last year and not had $16 million in dead money this year and then traded him,’’ said Corry. Corry isn’t buying Giants GM Dave Gettleman’s two first-round picks theory, meaning he not only got the Browns’ No. 17 overall this year but former 2017 first-round pick Jabrill Peppers as well as the No. 95 overall pick in the third round in exchange. So you quote an opinion of someone commenting on a subject where every opinion is subjective. Gotcha. Exactly. But remember, everybody on the TV said it was a bad deal so it must be true [sarc]. I’ll agree that trading him for 1 1st rd pick in 2018-19 offseason before the big contract makes more sense, and I wanted that, but they made a good move all things considering.